More houses by Paul Rudolph. 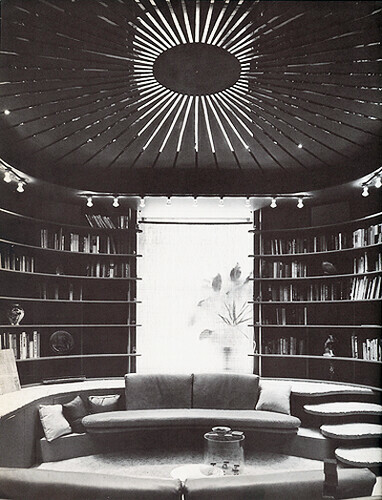 I’m not sure why I like him so much; maybe it’s the feeling that every space is designed for a party, or the use of white, or that he went so glam/space age in the 60s and 70s. I like all the low Japanese-style seating, often set in one-step-deep conversation pits. Almost all his houses have this in common, whether they’re strict midcentury modern or 60s/70s mod. Whatever happened to conversation pits? I believe he’s underrated. His Modulightor house was in the previous post, and above is the Milam Residence; below is the Green Residence. Below, the Cohen House, also via here, shown present day (in condition almost identical to original, for resale since it’s currently for sale) and also shortly after it was built. But what happened to the cool lamps flanking the fireplace? The Hiss Residence, also known as the Umbrella House. 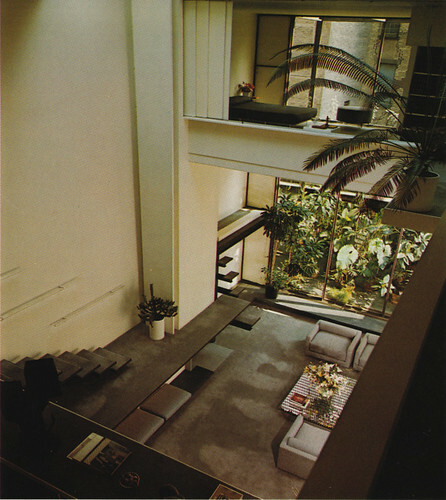 All photos by Kelviin of the Paul Rudolph Foundation. Below is the fairly psychedelic, late 70s glam Edersheim Apartments. Rudolph’s own apartment in the Beekman Building: lots and lots of parties. Lots and lots of house plants. This entry was posted on Tuesday, May 26th, 2009 at 2:36 pm	and is filed under architect, architecture, art, design. You can follow any responses to this entry through the RSS 2.0 feed. You can leave a response, or trackback from your own site. yes, what did happen to conversation pits? maybe the tv. time for a comeback of living low and talking. or playing scrabble. or what have you. I agree about the conversation pits. Rudolph used them in most of his residential designs, in the beginning as 1 or 2 step depressions in the floor, but later elevating them above the main floor to create balconies or “nests”. He even put one in the center of his office when he worked in New Haven. The use of multiple levels in Rudolph’s work is fascinating to be in (I work at Modulightor where there are multple levels and balconies) but not very friendly in the ADA regulated present day. The play of levels in Paul Rudolph houses are superb. They add tremendously to the whole experience and so are mostly placed centrally as focal point. They also give such visual delight as not seen in any other architect’s work. Conversation pits would be a great source of bonding in the current stressful life style, even if one has to add the inescapable tv of today.